The M/V Crane was built in 1927 on Bainbridge Island in Puget Sound by the J.C. Johnson Shipyard for the U.S. Bureau of fisheries. 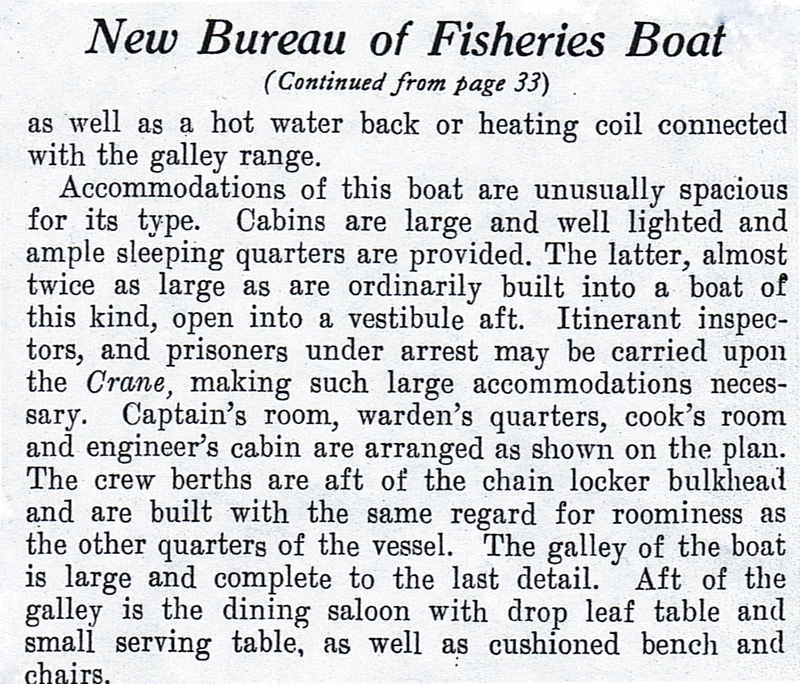 Designed by prominent Seattle Naval architects Coolidge and Hanson. She first worked the halibut and fur seal trade in the Bering Sea, patroling and delivering supplies. She then spent close to 30 years in the Shumigan islands in the Gulf of Alaska doing fisheries patrol and research. 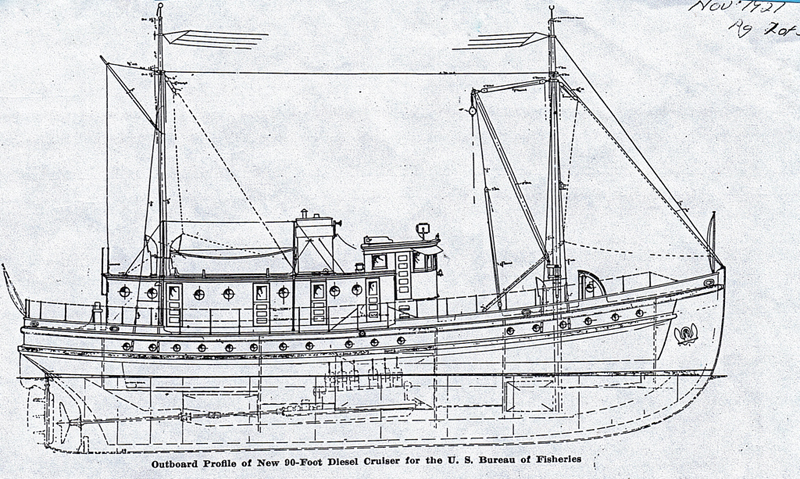 When Alaska achieved statehood, federal patrol boats were no longer needed. The Crane was then retired into private hands. She spent several years cruising the Pacific in search of tuna. For twenty-five years she worked the waters of southeast Alaska, based out of Ketchikan packing fish for the herring and salmon fisheries and performing other pleasant duties. When we purchased the Crane in November of 2003, we loaded up with friends and family and headed south from Ketchikan. Upon our arrival in Seattle the honeymoon was over. This began the long road of major repair and constant maintanance that comes with owning and operating an 80 year old wooden boat. It is a labor of love. Now after almost 6 years the Crane is ready again. Our salon is designed with your cruising comfort in mind. Settle back into our comfy leather couch and chairs to relax, read, or visit. Enjoy delicious, home-cooked meals served at the spacious dining table. Comfortable accommodations for 4 to 6 guests in three private staterooms are located below the salon. The classic wheelhouse brings history to life, with the benefits of modern navigational tools. The legends and lore of the sea are part of every voyage. Our covered fantail aft of the salon provides an ideal place for sightseeing while underway, or an evening repose while drifting lazily in one of the beautiful anchorages. The Beaudin Family of Livingston, Montana own and operate Crane Adventures. Captain Chris Beaudin has his 100-ton Captains license, and 32 years of experience fishing and working throughout Alaska. The M/V Crane is equipped with all Coast Guard recommended safety equipment. Our trips bring to life the enchantment and wonders of this magnificent corner of the world. 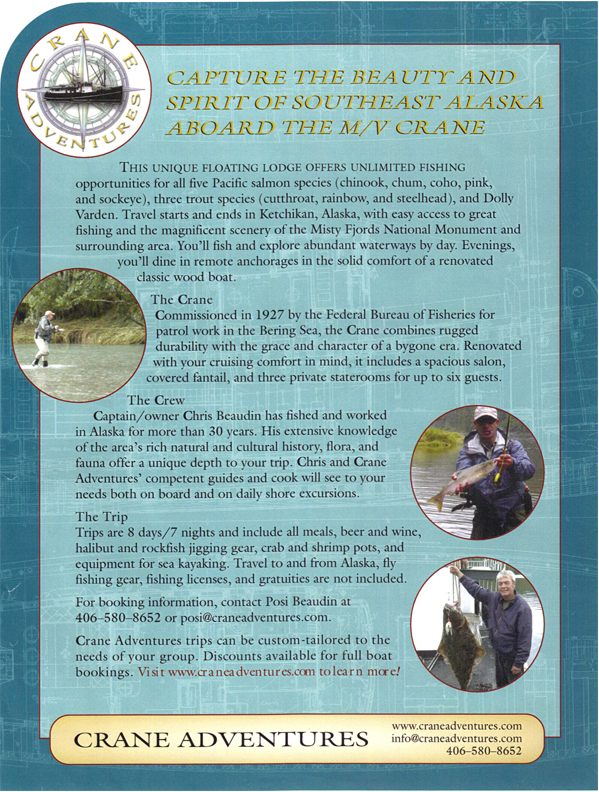 We look forward to sharing the true Alaskan experience with you. Let us help you design the adventure of your dreams! View the M/V Crane Brochure! Crane Adventures is an Equal Opportunity Provider proudly operating under a Special Use permit issued by the USDA-Forest Service-Tongass National Forest.